“In 1918, M. M. Hamner, Sr., J. 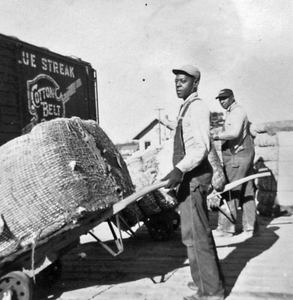 B. Edwards and L. B. Hamner formed a partnership to operate a cotton warehouse. Using their own capital, they erected three sheet-iron buildings, 75’ x 140’. Later they sold some stock to Charley Smith and W. T. Murphy, Jr. The warehouse was in operation until the outbreak of World War No. 2 and, because of conditions peculiar to those times, such as labor shortage, etc., it was decided to close down the business. In December, 1948, M. M. Hamner, J. B. Edwards, L. B. Hamner, W. T. Murphy, Jr., and F. M. Cochran, who bought the interest of Charles Smith, held a meeting and decided to reactivate the warehouses, form a Corporation under the laws of the State of Arkansas known as Bradley Warehouse, Inc., and Government Bond it. With an additional investment of $25,000.00, all local capital, the three existing warehouses were completely repaired, inside and out. A 128’ well was put down, a 25,000 gallon water tank was erected and all buildings were equipped with sprinkler systems. The Government approved the warehouse for the storage of 5,000 bales of cotton. In 1953, it became quite evident that the three houses could not take care of the cotton to be stored, and in the fall of that year, an 80’ x 140’ galvanized Butler building was erected at a cost of $25,000. This, too, was equipped with a sprinkler system. The Government increased the approval to 7,000 bales. Such was the state of Bradley Warehouse, Inc., in 1957. In 1978, Bradley Warehouse, Inc., sold its physical plant to Farmers-Merchants Warehouse & Storage Co., Inc., a Louisiana corporation with principal offices in Plain Dealing, and the corporation itself was liquidated shortly thereafter. According to the Lafayette County Tax Assessor’s records, the real property is now owned by Southern Arkansas Warehouse & Gin, L. L. C., an Arkansas limited liability company. Shown below is a photo from the 1957 B. & P. W. scrapbook, showing the physical plant. Immediately below it is a photo taken from approximately the same place and angle on October 14, 2008. The most obvious difference in the two photos is, of course, the disappearance of one of the 1957 water tanks. Also, in the 1957 photo, the street has not yet been paved. Shown below are three photos from the 1957 B. & P. W. scrapbook of some of the activities and employees of the Warehouse at that time. If any reader should recognize any of these men, I would very much appreciate an e-mail or comment to that effect, and would gladly add their names to this post.